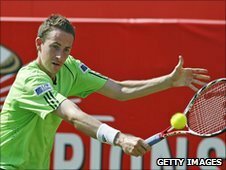 British number 12 Richard Bloomfield reached the semi-finals of the Hall of Fame Championships with his third consecutive upset in the tournament. Bloomfield followed up shock wins over Christophe Rochus and Santiago Giraldo, with a 5-7 7-6 (7-3) 7-5 victory over Ryan Harrison, who is world-ranked 262. The 552-ranked 27-year-old from Norfolk will next face another American, Mardy Fish, in Newport, Rhode Island. World number 79 Fish defeated Canada's Frank Dancevic 6-7 (6-8) 6-4 6-4. Saturday's other last four encounter pits Argentina's Brian Dabul against Belgian Olivier Rochus. Right-hander Bloomfield turned professional in 2002 and was Britain's number four by 2006 before reaching a career-high world ranking of 176 the following year. He has never won a title on the men's tour, and his best singles result at Wimbledon - the only Grand Slam tournament he has played in - was making the second round in 2006 after an unexpected win over Carlos Berlocq.